Behind This Exuberant Dance Number? 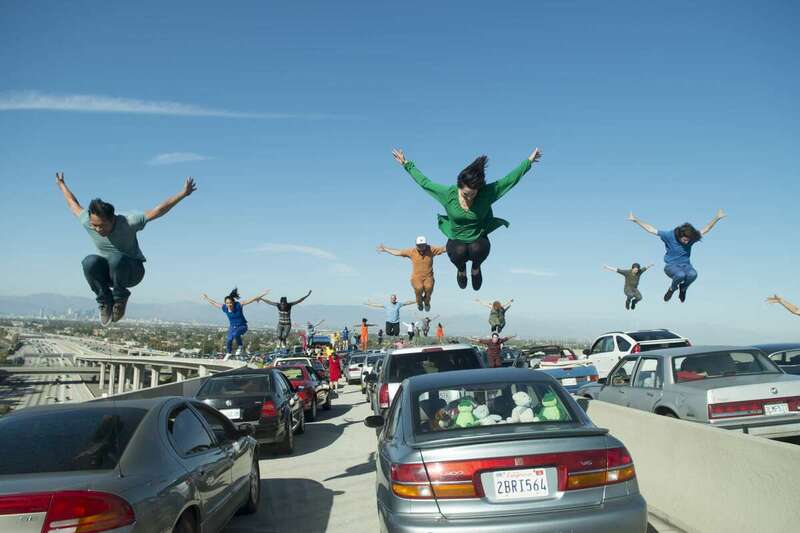 Planning, Precision And Practice Choreographer Mandy Moore was lying underneath a car on the LA freeway, counting and calling out steps, throughout the 47 takes it took to shoot La La Land's fun-filled opening scene. Choreographer Mandy Moore was lying underneath a car on the LA freeway, counting and calling out steps, throughout the 47 takes it took to shoot La La Land's fun-filled opening scene. The opening scene is a wow. A typical, Los Angeles traffic jam — blue skies and sunshine over the congested ramp where the 105 freeway meets the 110. Frustrated drivers are stuck sitting in bumper-to-bumper traffic. All of a sudden they get out of their cars and start to sing and dance! They're hopping, jumping and somersaulting over cars and trucks — and all throughout the joyful number, choreographer Mandy Moore was underneath one of the cars — "screaming out the counts. It was really fun," she says. The scene was filmed with 30 professional dancers and more than 100 extras on a 104-degree day. They first rehearsed in a parking lot, and later the actual freeway at 3:00 o'clock in the morning. On paper, Moore and director Damien Chazelle mapped out where the cameras would go. That morphed into 3D on a model ramp with toy cars. Then it was show time, which meant shutting down the freeway ramp for two days of shooting. All in all, it took 47 takes — for a three-minute and 48-second dance number that occurs entirely before the movie title looms up on screen. "I've seen it in the theater many times now and it still gets me." Moore says. "As soon as it says 'La La Land' it stops on that beat and people just clap! I've just never been in a movie when they do that!" This is Moore's fourth film. She's been choreographing for 12 years — mostly TV, for shows like Dancing With the Stars and So You Think You Can Dance. Growing up in Breckenridge, Colo., she fell in love with the great old movie musicals — Singing in the Rain, An American in Paris, Seven Brides for Seven Brothers. "My mom said I was always dancing around when I was a little kid," she says. "I put on performances for my family. I'd make them all sit down and watch. She put me in dance at 8, and from that point on, I never wanted to be anywhere else." Moore met us in Los Angeles' Griffith Park, where several scenes were shot. She's 40, with green eyes, long hair, and hands that dance when she talks. She also has the generous patience of a good teacher. There was a good amount of teaching for her to do. In La La Land, Moore was working with two non-dancers. In just two months, the stars studied singing, piano and dancing. Gosling, who plays the part of a jazz musician in the film, had never studied dance before. "He said, 'Yes, I have rhythm, I know how to perform, but no, I'm not like, good,' " Moore recalls. "So he basically was like, 'Let's start tomorrow.' "
He and Stone had different approaches to their dancing lessons. "She likes to get the movement immediately — she's like a little machine; she gets it exactly right," Moore explains. "Where Ryan was very, very different. He'd take a long time to get the step. I'd have to go over and over it with him." Sometimes he looks as if he's counting, but he dances gracefully, and in character. Gosling and Stone have a lovely they-don't-like-each-other-then-they-fall-in-love duet on a hill in Griffith Park. It's sunset and they're on a bench overlooking LA's evening lights. She swaps her heels for flats, and the next thing you know, they're dancing. Moore borrows some steps from a classic Fred Astaire and Ginger Rogers routine from the 1935 film Top Hat. Dispute and disdain give way to a song and dance. In those days of Hollywood censorship, dances were the love scenes. In La La Land, some still are. You'd never know it, but the sweet, 6 minute, 30 second Griffith Park duet was filmed under quite a bit of pressure. "The director wanted this all to be in a single take," Moore explains. So, one camera, no edits. Director Damien Chazelle wanted the sunset colors to be just right — there was no money to fix colors in post-production — which meant they had to shoot during the "magic hour," that fleeting time when the city is bathed in a reddish, golden light. "Magic hour allowed us to have about five takes," Moore says. "And usually take number 1 was too light. Take number 5 was too dark. So they basically had three chances to hit this thing. And we shot it for two nights. So we had six chances to make this happen — on an incline, on asphalt, not being dancers. I mean, it's incredible to think what they did." Watching her stars' natural movements, basing her dances on those moves, and shaping them toward grace and fluidity, choreographer Mandy Moore helped fashion a technicolor musical for today.